Electronic Circuits (1st and 2nd) is based on a particular philosophy of teaching which has been used for practical circuit analysis and designs. It is assumed that students has a background in linear passive circuit theory, which includes a thorough grounding in the use of Kirchhoff’s laws in DC and AC circuits. The prime objective of this text is to provide insight into the analysis and design of electronic circuits, both discrete and integrated. The electronic circuit textbook is separated into two part namely ELECTRONIC CIRCUIT 1 AND ELECTRONIC CIRCUIT 2 with 7 chapter of each. The part 1 cover 7 chapters related to the analysis and design of diode and transistor circuits at low frequencies. Gain, sensitivity, and impedances are studied in detail from both analysis and design points of view. The principles and advantages of feedback are considered in the chapter 7 which is the most difficult chapter in the Part 1. 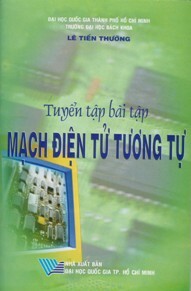 A basis simulation software PSPICE is also provided in the appendix. It would help students to meet the checking for their analysis by simulating the circuit on computers. This book is intended to provide a fundamental coverage of digital signal processing for undergraduate students. The book is mainly designed from the combination of many excellent books on signal processing issues. It's composed to use for both under and graduate levels therefore it should be limited for the number of chapters in the book when used for undergraduate level. The problems after every chapter and the MATLAB software are important and highly recommended for an efficient study.